Apart from the food itself, what makes our food culture so rich and a big part of identity also has to do with the way we package our food. 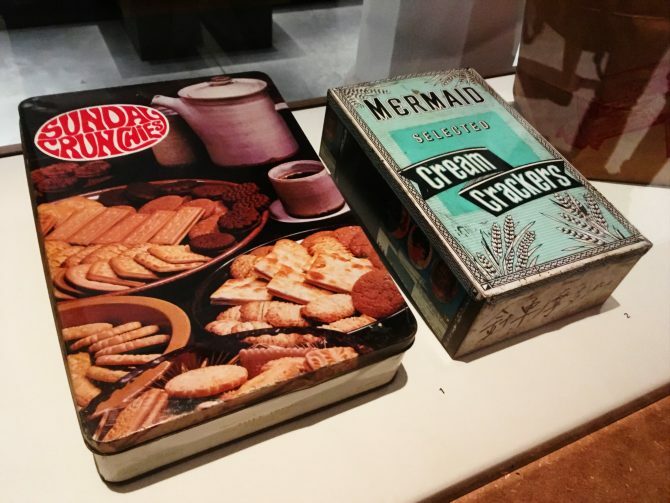 How has food packaging evolved in Singapore over the years? 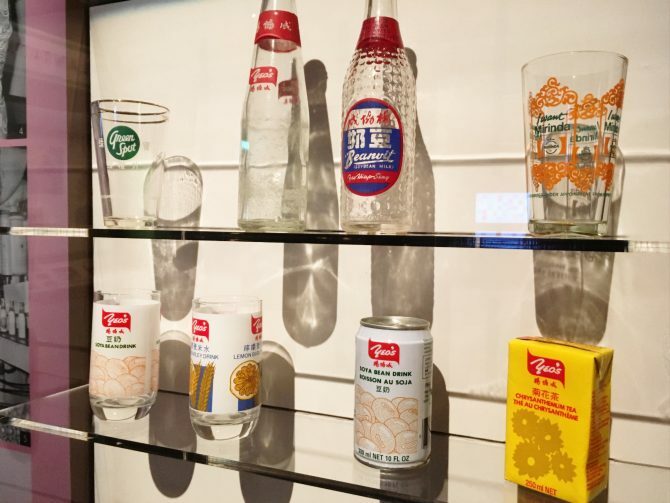 Travel back in time to find out, at the National Museum‘s new exhibition, Packaging Matters: Singapore’s Food Packaging Story from the Early 20th Century. Opening free to the public on 6 April, it offers a unique experience that foodies, local history buffs, and anyone who loves vintage nostalgia should not miss. 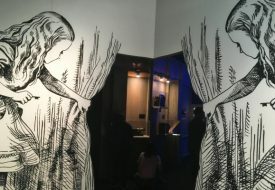 The title pretty much sums up the idea and structure of the exhibition – the exhibition takes visitors back to various pivotal time periods in Singapore’s history of food packaging, starting from the early bottling and canning technologies in the early 20th century, and moving to the manufacturing developments in the 1960s and 1970s. It tells this fascinating story through the use of over 150 artefacts from the museum‘s folklife collection. Remember those old metal biscuit tins from Jacob & Co., or the former Thye Hong Biscuit and Confectionery Factory? Or the huge paper bags of condensed milk? In addition to the technologies used, our food packaging is unique for the designs and signature look of local food brands. The artefacts at Packaging Matters showcase a range of different food and beverage manufacturers, many of them small-scale and run by local families. They include Thye Hong, Amoy Canning Corporation, Yeo Hiap Seng, and Prima Limited. As we toured the Stamford Gallery, we found many items familiar, but they amounted to less than half of what’s displayed. If, looking at the photos, you feel the same way, ask your parents and grandparents! If they have grown up in Singapore, they would find most of the artefacts very familiar and nostalgic. 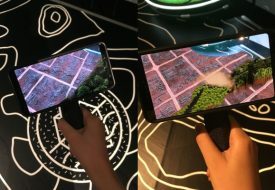 Explore this exhibition with your whole family – it is a wonderful and enriching way to connect multiple generations of Singaporeans. For parents, it is a chance to introduce your kids to the items that were a part of your childhood. Packaging Matters is indeed designed very much for families, with a bunch of fun family-friendly activities integrated into the exhibition. Great for all ages to participate in, the activities make the learning about story of food packaging an interactive experience. One of them is the Feely Boxes, placed at a few corners of the gallery. Put your hand through the hole and feel the objects inside. Try to guess their material – paper, plastic, metal, or glass – and maybe even the product itself. Then, pull open the box and see if you got it right! The young generation would also recognise many of the brands, especially those that continue to run today. We found ourselves gravitating to the familiar Van Houten tin of chocolate almonds, the Horlicks tin, old-school drink packaging from Yeo’s, and tingkat carriers. There’s even a Big Mac styrofoam container! 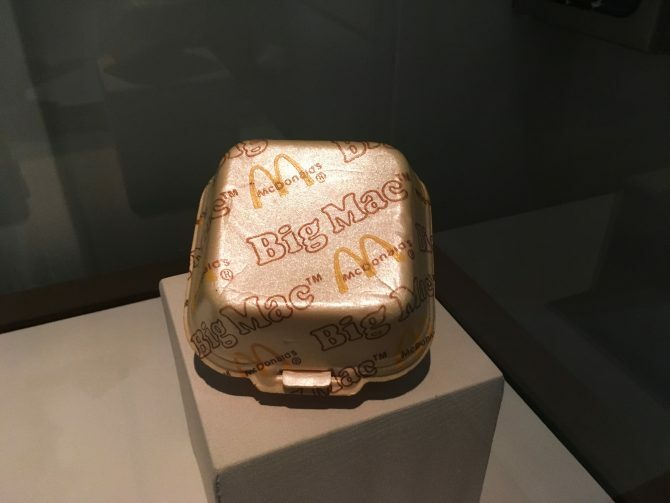 McDonald’s switch from styrofoam to paper reminds us of a sobering fact – we need to continue modifying our food packaging practices to make them sustainable. Earlier technologies that depend on glass and metal are more environmentally-friendly than our modern excessive use of plastic and styrofoam, especially for takeout. 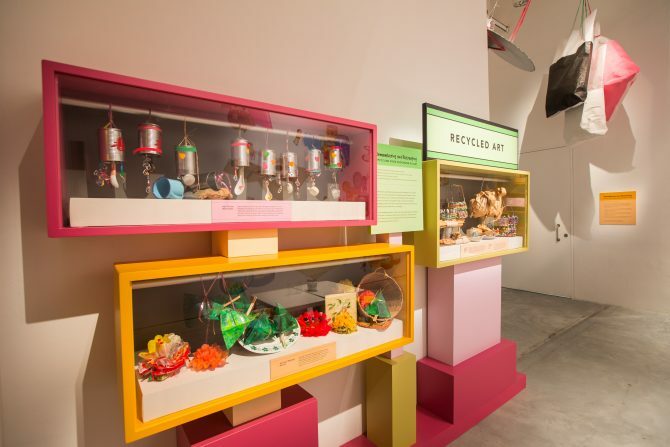 Get inspired to make your own food packaging practices more sustainable at home, by checking out the upcycled installations. A group of seniors with dementia have taken packaging they remember from their younger years – such as kopi tin cans and brown paper bags – and transformed them into a series of art pieces. Visitors are invited to get creative too, at the creative corner. Draw your favourite food in its packaging, and imagine a more green material it could be made of in the future – your drawing could be displayed in the gallery! Earth Day is almost here, and our Ministry of the Environment and Water Resources has announced that 2019 is Singapore’s Year Towards Zero Waste. Besides immersing us in a wave of nostalgia, the exhibition gets us involved in taking better care of our planet through our everyday interaction with food. 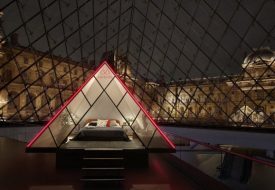 Be sure to visit the exhibition during opening weekend (6 and 7 April), to get the best and most of the experience outside of the gallery walls! 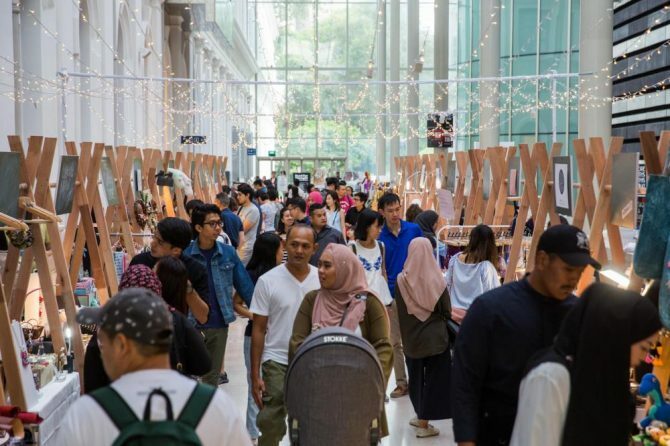 There’s a series of free public programs lined up at the National Museum related to Packaging Matters throughout the two days – shop at a food and craft market (bring your own containers for discounts at selected stalls), enjoy an indoor picnic as you watch a film about Singapore’s food heritage, get crafty at upcycling workshops, and more. Check out the full schedule of opening weekend activities here. Want even more? Dive into the contemporary food packaging ideas by our newer local brands at a talk by one of our most popular homegrown sushi companies. On 20 April, from 2pm to 3pm, Maki San will share how and why they decided their super Instagrammable sushi boxes, and future plans to go even more green with their packaging. Get your tickets ($5 per person) here. 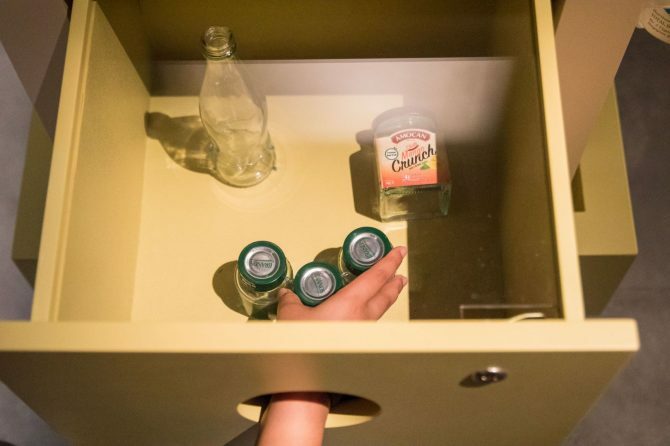 Those who would like to explore Packaging Matters in greater depth, or have questions about it, can sign up for the Curator Tour on 25 April, 7:30pm to 8:30pm. Get your tickets ($10 per person) here. 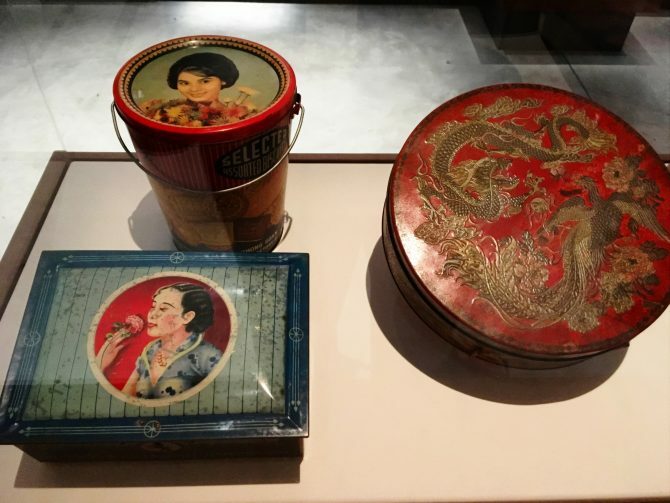 Packaging Matters: Singapore’s Food Packaging Story from the Early 20th Century will be open to the public from 6 April to 15 September 2019. Admission is free. Visit the official website for more information.